Day four at ESOF. Mostly about food. It definitely felt like Saturday as I waited for the bus from the hotel at 7 this morning. The roads were much emptier, and the bus timetable at the stop told me that the most frequent service didn’t actually start until 8 at the weekend. Still, I got into town quickly, and failed to get a coffee in the completely deserted docklands area, or indeed in the convention centre, where they had removed the coffee stand in the foyer. Still, my first session was the intriguingly-titled “What Should European’s Eat?” and the answer might have emphatically said “not-coffee” so perhaps I had a lucky escape. The question was explored by nutritional, demographic and statistical experts from Greece, the UK and Finland, each giving a kind of history of the national diet and the role of scientific studies of eating habits and how they relate to setting government nutrition recommendations. Greece, with its historic diet consisting of a lot of olive oil, cereals, fruit and vegetables, with some fish and meat, with red meat eaten quite rarely, had been discovered to coincide with good health (particularly cardiovascular) and longevity in a study called the Seven Countries Study, which looked at a large cohort over many years. This is reflected in the advice in the Greek Food Pyramid, which shows food at the bottom that should be eaten every day, moving up to food that should be eaten more rarely at the top. This diet used to be almost universal (so I learnt from the speaker) in many mediterranean areas in the past, but over the last 50 years or so has eroded so that just under half of inhabitants could be said to follow this traditional diet. Co-incidently, or not, you may have recently played with the "Where are you on the global fat scale?" tool on the BBC News and noticed that Greece now has a greater rate of obesity than the UK. Speaking of which, the second speaker was Toni Steer from the UK, talking about research into UK diets, in which a sample of the population keeps a diary of what they eat, which is then extrapolated to give different food nutrient profiles across different age groups. It wasn’t quite as horrific as I expected, even though as the speaker admitted she was concentrating on the negatives to some extent. What was clear was that we eat too much saturated fat than is good for us in the UK, and too much salt, though the total energy we receive from fat does not exceed the recommended amount. As I think is well-known, low incomes lead to an increase in convenience food and other processed foods and poor people tend to have poorer nutrition. The speaker from Finland said a lot of interesting things, mentioning like the Greek speaker had, that things had changed a lot in the last 50 years. 50 years ago the Nordic diet was very fixed; the same for almost everyone in the country; rather seasonal, with a lot of greens in the summer and practically none in the winter. Quite high amounts of fish and dairy. A lot of berries, seasonally. This has changed along with social changes, such as increased wealth which has allowed people to afford unhealthy luxury food (so I guess given the UK example above, it’s better to be not too rich or poor!). Although the message had come through from all speakers that the northern European countries eat too much dairy generally, she did say that the best thing to have for breakfast was wholemeal porridge (made with milk) with berries. So maybe I will make an effort to try that more often. I do rather like porridge. She also spoke of the virtues of rapeseed oil, which has become prevalent in Finland. I suppose I would not be taking her advice in the right spirit if I started eating a lot of chips deep-fried in rapeseed oil, though. Still, might be worth a try. So, the talks covered some studies of nutrition in the different countries, with a historical perspective, and some discussion of what each government recommends (the website I found the graphic for the greek food pyramid looks like it has a nice summary of this, actually, though I haven’t read it in detail). I’m not sure I really knew the answer to the question What Should Europe Eat? by the end of it, as such. After the speakers finished, it was question time. I asked the first question, which was about sustainability and energy use in food production. Some food practices are unsustainable – such as fishing for certain species, or not allowing land to recover nutrients, and some others over-use resources, such as, say beef production (see e.g. UK Government Advisor David MacKay’s book Sustainable Energy), so I asked if these issues should be taken into account when making official recommendations in answer to the question posed by the session title. The UK speaker took up the question, and said that they were starting to consider such things. She said that if everyone in the UK took the official government advice to have a few portions of oily fish per week, then this would not be sustainable. I didn’t know that. The chair of the session told me that my question was his backup question in case he needed to fill in (this is one of the key role of session chairs in conferences and discussions), and that he was involved in making recommendations to the nordic countries’ governments and that they were going to include a section on sustainability amongst food recommendations. Interesting. He also said that the recommendations had to be achievable, and that though there are no positive nutritional reasons to eat red meat, recommending removing it from the diet entirely would not go down well, and ultimately be futile. Anyway, I enjoyed that session. It was pitched at a level that I learned quite a lot about a subject I didn’t know much about. To the extent that I understood everything perfectly (and don’t take this as perfect advice – I’m not an expert here), the message I got was that from a purely nutrition point of view, a great diet would be everything that a vegan eats, plus fish. Anything else – okay in moderation, but perhaps not as a staple. Real nutritionists feel free to comment, below. Oh, the session didn’t mention coffee! Next I went to a physics talk by Lisa Randall. I’ll not go into so much detail here, partly because I don’t think I learned nearly so much from it. Not because it wasn’t a good talk, but it’s my area (roughly) and she aimed at a very general audience. She just started to get to things that intrigued me – why an extra dimension of space may explain why gravity appears to be so much weaker than the other fundamental forces of nature – when she stopped. Perhaps I should read one of the books she has written on the matter. I took a lunch break at that point. 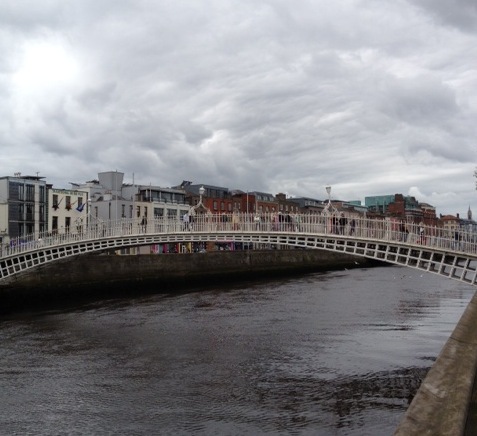 The picture accompanying this post is a rather poorly-framed shot of Dublin’s famous ha’penny bridge that I walked across. If anything, it shows at least that you should not be jealous of the weather I’ve had over here. Now I think I am done with the festival sessions. My colleague who works in the neighbouring office to me back in Surrey’s Physics Department, Alan Dalton, is arriving soon to show me around his old stomping-ground near Trinity College. What could possibly go wrong?